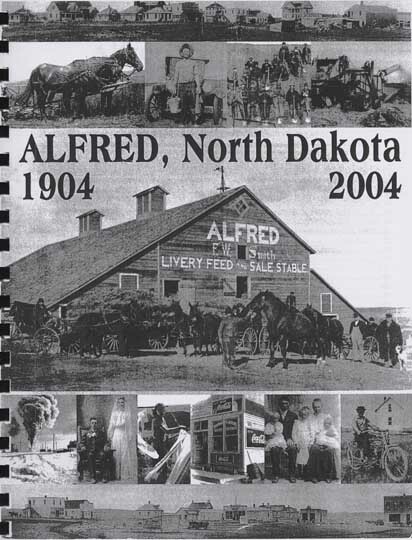 The Table of Contents includes: Chapter 1, Introduction - Introduction to Our Beginning: The Founder of Our Village, Richard D. Sykes; Early History of Alfred, North Dakota; some Excerpts from an Article in the Jamestown Sun, Dated March 3, 1949; Area Farmer Make Rock Picker (article from the Jamestown Sun, August 134, 1952; John Henne, Inventor, Farmer, American (article from the Pioneer Press, October 5, 1983; A New Country, A New Opportunity; Windmills serves as reminder of America's pioneer heritage (article from the Jamestown Sun, August 12, 1992); Chapter 2, Family Histories; Chapter 3, Reminiscences; Chapter 4, Schools; Chapter 5, American Legion, Leno-Schenkler Post 295; Chapter 6, The Churches of Alfred; Chapter 7, People and Scenes of Alfred; Chapter 8, Records from the Alfred Cemetery, Records of Internments, Lot and Grave Numbers. The Family Histories include these names: Bapitzke, Barr, Beglau, Ben, Bennett, Beopple, Beyer, Boldt, Bossert, Brenneise, Dahl, Dewitt, Doolittle, Dorr, Dufloth, Eberhardt, Ehmann, Elhard, Entzminger, Flaig, Fode, Fouts, Freeman, Geinert, Gohner, Gumke, Heine, Heier, Henke, Henne, Herrmann, Holmstrom, Hopkins, Hust, Irion, Jahnke, Johnson, Johnston, Kalmbach, Kern, Klundt, Koenig, Konrad, Krause, Kuhn, Kurtz, Lang, Larson, Lehr, Madche, Mayer, Meidinger, Metz, Miller, Mogck, Mueller, Netz, Netzer, Nies, Nitschke, Oberlander, Ova, Overlander, Pfeifle, Presler, Radach, Reinhardt, Remboldt, Renschler, Rode, Roehr, Sather, Schlenker, Schott, Schroeder, Schweitzer, Smith, Speidel, Stiewe, Suko, Wegner, Widmer, Vetterboe, and Ziemann. There is a Family Histories - Index and many photographs throughout the book.